The Yarn Bodied Soft Hackle Tying Kit contains a package of partridge hackle, a package of 25 Daiichi hooks, a package of Nymph yarn, two spools of thread (one brown and one gray - matching the brown and gray strands in the yarn and the brown and gray partridge feathers in the package) and a step-by-step instruction sheet with full color photos. 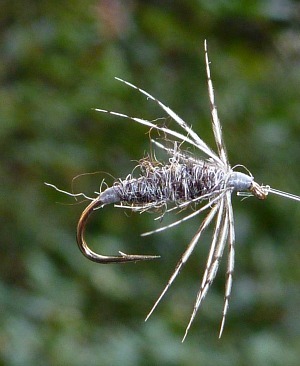 Ever since I first tied Frank Sawyer's Killer bug I've been astounded by the effectiveness of a yarn body for flies. The Killer Bug has been my most effective fly. Some of my larger fish, though, have been caught with the modification I call the Killer Kebari, which is essentially a Killer Bug with a soft hackle. Other tenkara anglers have made their own modifications. Kiwi kept the same yarn but reversed the hackle to produce Kiwi's Killer and then added a peacock collar to make a CS Special. The Tenkara Guides in Salt Lake City replaced the Killer Bug yarn with Purple Haze or Mist or Moorit yarns, and replaced the plain brown thread with a UV thread. All the flies are variations on a theme - yarn body soft hackles. One advantage of yarn for wet fly bodies is that it absorbs water. That doesn't make the fly sink any better, (the water on the fly is no heavier than the water in the stream, after all) but it does add just a modest amount of weight to the fly - so a very light line and a very light tippet turn over better. This kit follows the same theme but it takes advantage of the gray and brown coloration that is found in partridge feathers and in the Nymph yarn, which is a two strand yarn with one brown strand and one gray strand. Thus, the kit allows you to tie both brown and gray soft hackle flies. I think you may find that these flies work so well you don't need any other colors. On line, you'll see comments suggesting that you should really buy a full partridge skin rather than packages of partridge feathers. There is no doubt that you'll get many times the number of feathers, but you'd also have to pay many times the price. There are also comments that the feathers in the package aren't good quality. That is a statement I'll take issue with. This kit was designed to allow you to tie 25 flies (after all, it only comes with 25 hooks). I am sure there are more than 25 good feathers in the package. You may not be able to use every feather in the pack, but you'll be able to tie your 25 flies and have feathers left over. You probably know by now that I am not a "one fly" angler. I like flies too much to use only one. However, even if you want to follow a "one fly" approach to tenkara, the brown flies and gray flies you'll tie with this kit qualify as "one fly." Dr. Ishigaki who is the best known proponent of the "one fly" philosophy ties both black and gray flies. Despite being different colors, they are the same pattern so he considers them to be the same fly. These flies are also "kebari." 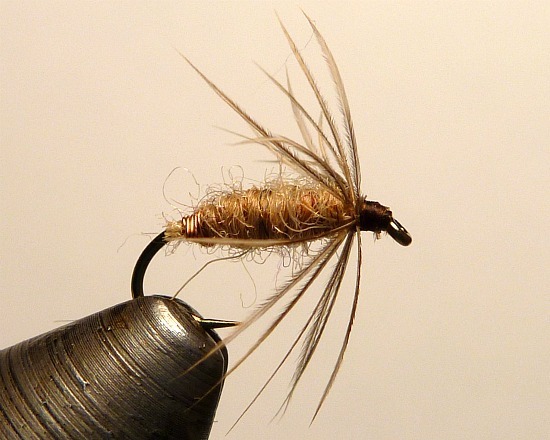 Many of the tenkara flies used in Japan do not have the reversed, or "sakasa" hackle. 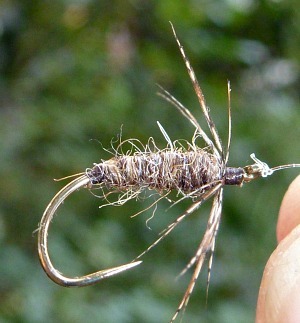 One of the Hida Takayama flies that Yoshikazu Fujoika has catalogued is a simple yarn bodied soft hackle. If that's good enough for Fujioka-san, it's good enough for me. Just want to say that the yarn bodied kebari is a success. Caught 11 fish on it, the gray. Your instructions are very precise and helped me to understand the hackle turn more. Thanks.